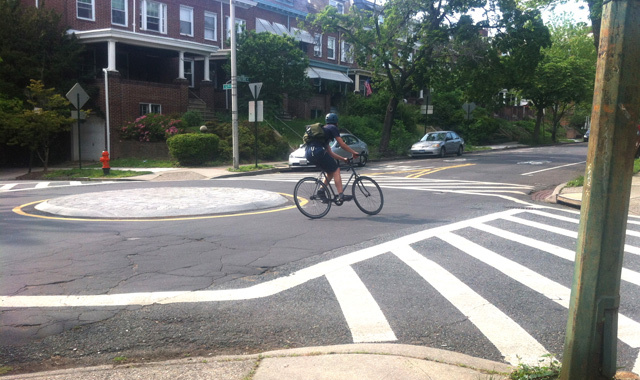 This intersection conversion on the Guilford Avenue Bicycle Boulevard uses a mini traffic circle configuration to reduce speeds and user conflict. Speed lumps on the Guilford Avenue Bicycle Boulevard slow automobiles while providing pass through capabilities for bicyclists and emergency vehicles. A mini traffic circle at 14th St. NW & Leegate Rd NW slows vehicles and clarifies movements at an skewed intersection. This Street Edge Alternatives demonstration project limits speeds on the shared street using a chicane design. 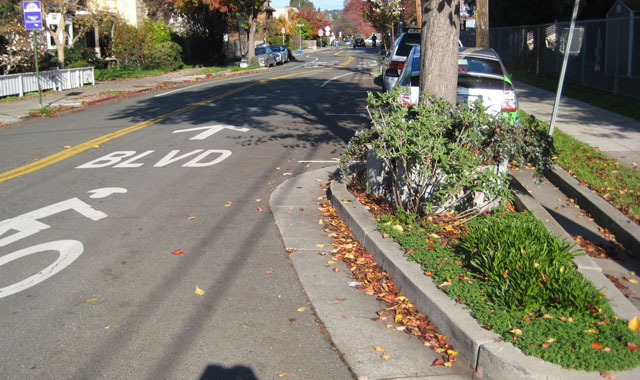 This Berkeley bicycle boulevard uses chicanes to horizontally deflect motor vehicles, lowering their speed. This neckdown narrows the roadway, requiring motorists to pass one at a time. This neckdown discourages rapid acceleration. 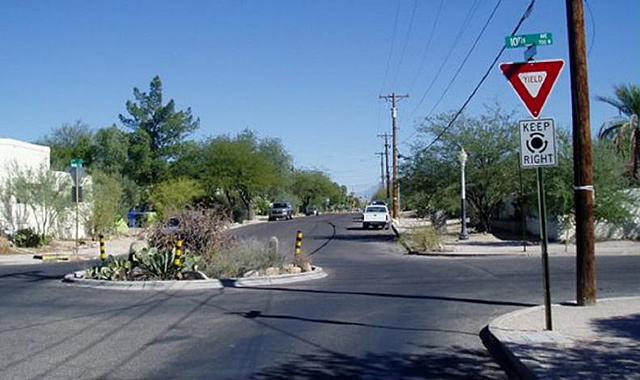 Mini traffic circles like this one in Tucson support low-speed motor vehicle movements at intersections without delaying bicyclists. Raised intersections such as this one at Oxford and Eustice Streets cause motorists to slow down while improving visibility for pedestrians in the intersection. A curb extension featuring an integrated bioswale calms traffic on this Portland bicycle boulevard. Speed humps, mini traffic circles, and 20 mph warning signs reduce vehicle speeds on this bicycle boulevard. Speed humps and median islands lead to reduced vehicle speeds on this bicycle boulevard. 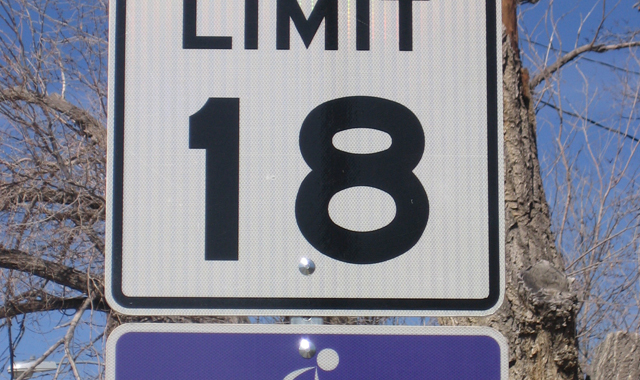 Albuquerque has set a 18 mph speed limit on bicycle boulevards to reduce the speed differential between motor vehicles and bicycles. Parking should be prohibited on the approach to mini traffic circles to maintain sight lines. 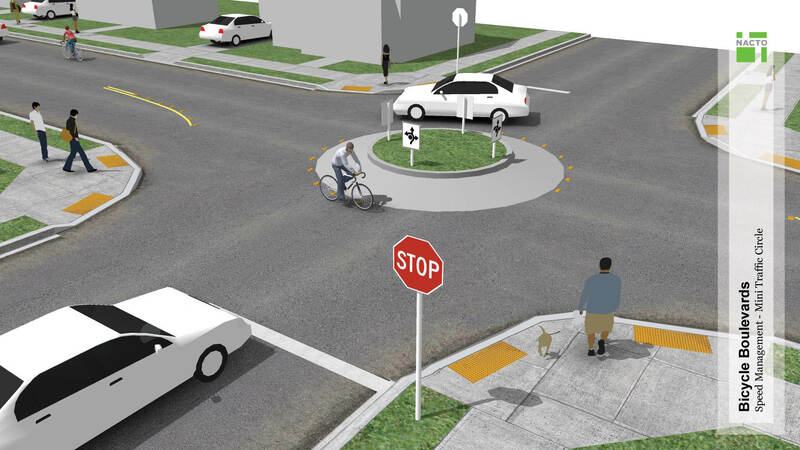 Mini traffic circles may be used to lower motor vehicle speeds near intersections with bicycle boulevards. 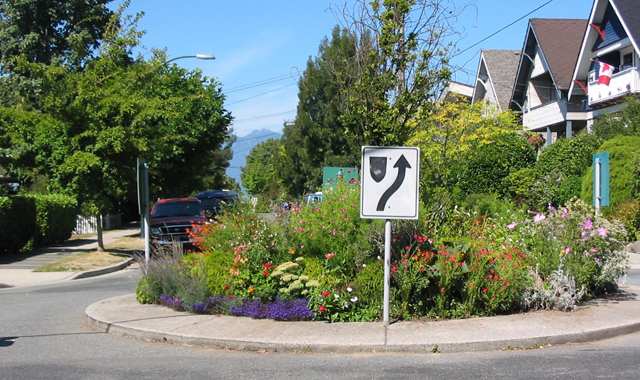 In Vancouver, neighborhood groups maintain gardens in mini traffic circles, which can be attractive street features that slow motor vehicles. Speed Management measures for bicycle boulevards bring motor vehicle speeds closer to those of bicyclists. Reducing speeds along the bicycle boulevard improves the bicycling environment by reducing overtaking events, enhancing drivers’ ability to see and react, and diminishing the severity of crashes if they occur. Speed management is critical to creating a comfortable and effective bicycle boulevard. Streets developed as bicycle boulevards should have 85th percentile speeds at 25 mph or less (20 mph preferred). Speed management (traffic calming) measures can be divided into vertical or horizontal features. These measures can be implemented individually or in combination to increase their efficacy. 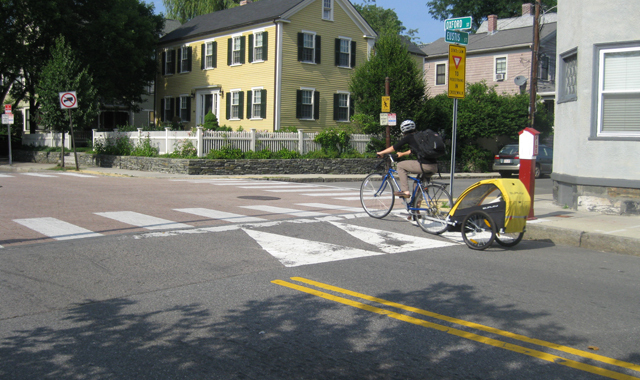 Common combinations include raised crosswalks with pinchpoints, raised intersections with pinchpoints, and speed humps with center island narrowings, chicanes, or pinchpoints. Refer to the American Planning Association (APA) U.S. Traffic Calming Manual (Ewing and Brown, 2009) and Chapter 15 of the Institute of Transportation Engineers (ITE) Traffic Engineering Handbook (2009) for detailed guidelines about speed and volume management treatments. Bicycle boulevards should have a maximum posted speed of 25 mph. Some jurisdictions are starting to sign residential speed limits below 25 mph. Simply changing the speed limit is unlikely to reduce speeds; speed management and street design techniques are necessary. Once actual speeds decrease, lower speed limit signs can reinforce the desired speed with regulatory control. Targeted enforcement is also recommended. 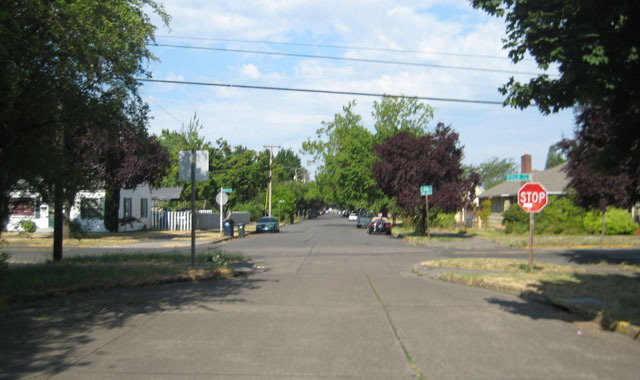 As of 2012, Oregon cities have authority to lower the speed limit on residential streets to 20 mph if the road has an average volume less than 2,000 vpd, an 85th percentile speed of less than 30 mph, and if there is a device (e.g., shared lane markings, warning signs) that indicates the presence of bicyclists or pedestrians. 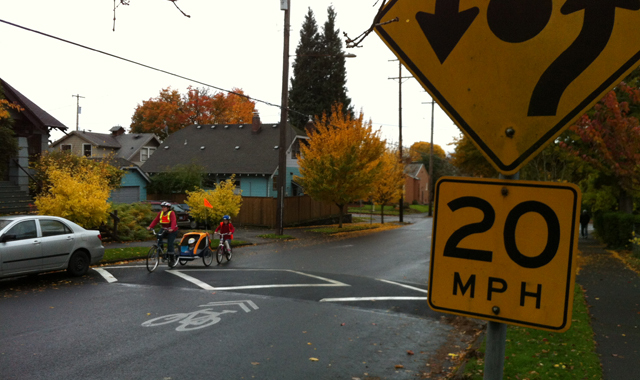 City of Portland staff intend to sign all residential neighborhood greenways that meet these criteria at 20 mph and have begun implementing speed management measures to create streets with target speeds of 20 mph in anticipation of the lowered speed limit. Albuquerque, NM, signs bicycle boulevards at 18 mph but has not used speed management to reduce the streets’ speeds. Targeted enforcement is used when a bicycle boulevard first opens, and electronic speed feedback signs reinforce the speed limit to drivers. In California, the prima facie speed limit in residential areas is 25 mph, which is the lowest speed limit allowed allowed, with specific exceptions. In order to enforce speed using a radar, a city must conduct a speed survey to justify the speed limit. Cities can post advisory speeds, such as a triangular, yellow 15 mph sign with a speed bump warning sign. Speed humps should be no more than 500 feet (152 m) apart or between slow points where the desired 85th percentile operating speed is between 25 and 30 mph. Institute of Transportation Engineers. (2011). Updated Guidelines for the Design and Application of Speed Humps and Speed Tables. Speed humps should be used with caution on hills where bicyclist speeds may exceed 20 mph. 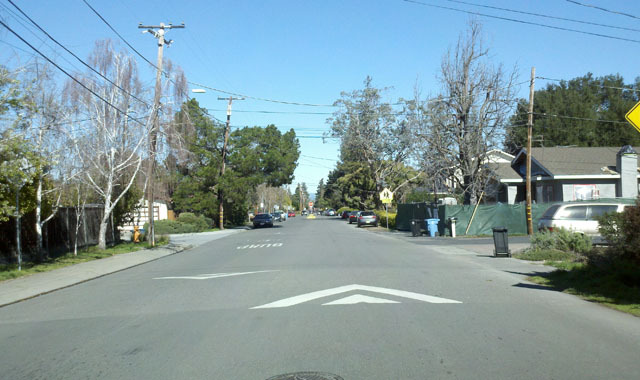 The City of Oakland, CA, only installs speed humps on streets with a vertical grade less than 5 percent. DeRobertis, M., and Wachtel, A. (1996). 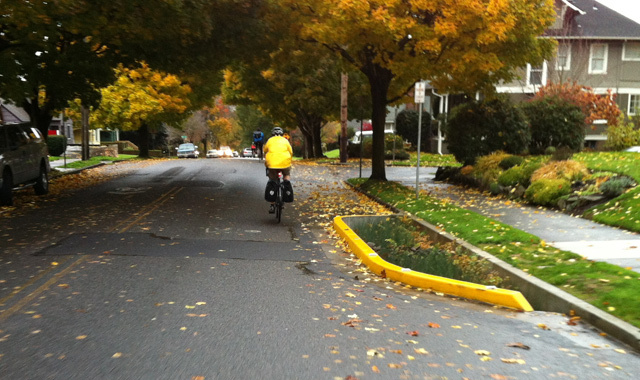 Traffic Calming: Do’s and Don’ts to Encourage Bicycling. Speed lumps or cushions have been found to have minimal, if any, impact to emergency vehicles in Austin, TX, and San Diego, Sacramento, and Danville, CA. Gulden, J., and Ewing, R. (2009). New Traffic Calming Device of Choice. On a 36-foot wide roadway, three lumps are optimal, with a 6-foot wide center lump to minimize emergency vehicle delay and discomfort, and the outside lump widths can vary. The wheel gaps should be 1 to 2 feet wide. 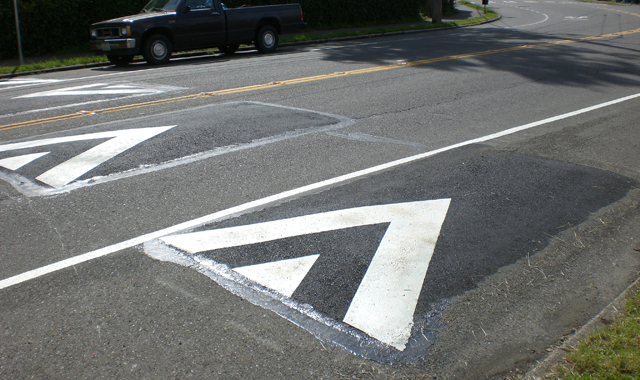 This configuration also allows bicyclists to pass through the speed lumps without having to leave the center of the lane; the City of Seattle marks shared lane marking arrows at the gap to guide bicyclists. Ewing, R. and Brown, S. (2009). U.S. Traffic Calming Manual. Berthod, C. (2011). Traffic Calming: Speed Humps and Speed Cushions. Parking alongside speed lumps may be restricted to enable bicyclists to pass through the outside of the feature. Speed tables are longer than speed humps and flat-topped, with a height of 3 to 3.5 inches and a length of 22 feet. Vehicle operating speeds range from 25 to 35 mph, depending on the spacing, and speed tables may be used on collector streets and/or transit and emergency response routes. Mulder, K. (1998). Split Speed Bump. Parkhill, M., Sooklall, R., and Bahar, G. (2011). Updated Guidelines for the Design and Application of Speed Humps. Raised crosswalks are 3 inches below the level of standards sidewalks, and an accessible curb ramp should be provided, as well as a surface textural indication for pedestrians with vision impairments. Horizontal speed control measures cause motorists to slow down in response to either a visually narrower roadway or a need to navigate a curving travel lane. 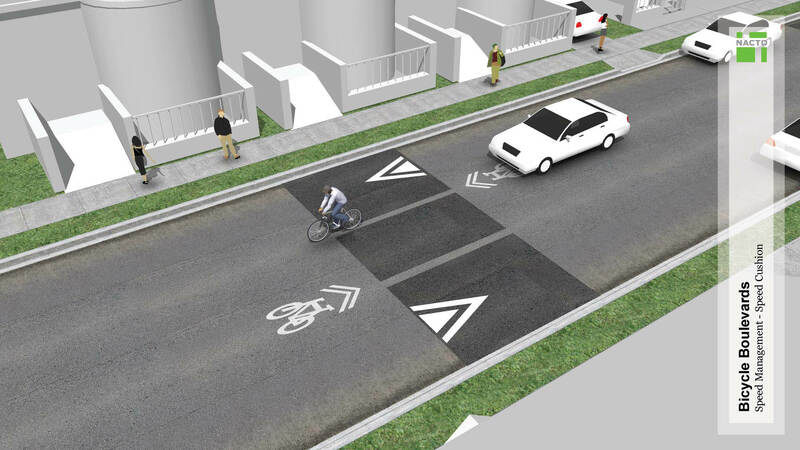 Where traffic calming features do not extend beyond the parking lane, they visually narrow the road and improve the approaching bicyclists’ view of cross traffic, but do not act as speed management. When motor vehicle speeds are already below target thresholds, elements can either extend into the travel lane or narrow a bi-directional street to a single lane. Under these conditions bicyclists are comfortable taking the lane and overtaking cars do not encroach on bicyclists’ space. Where possible, provide sufficient space for bicyclists to pass around the outside of the elements. Curb extensions or bulb-outs extend the sidewalk or curb face into the parking lane at an intersection. When placed on the bicycle boulevard, they visually narrow the roadway. Curb extensions on the cross street act as a minor street crossing. 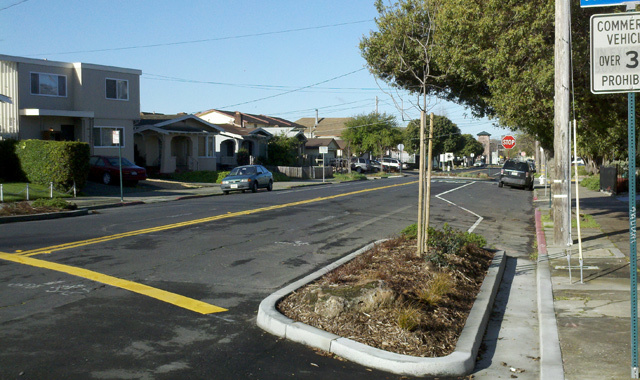 All curb extensions reduce the crossing distance for pedestrians, can increase the amount of space available for street furniture and trees, and can act as stormwater management features. Edge islands are curb extensions that leave a 1- to 2-foot gap by the curb to improve drainage. The number of automobile accidents at intersections [with traffic circles] fell 94 percent….Accident reduction was also found in subsequent years. Mundell, J. (No Date). Neighborhood Traffic Circles. 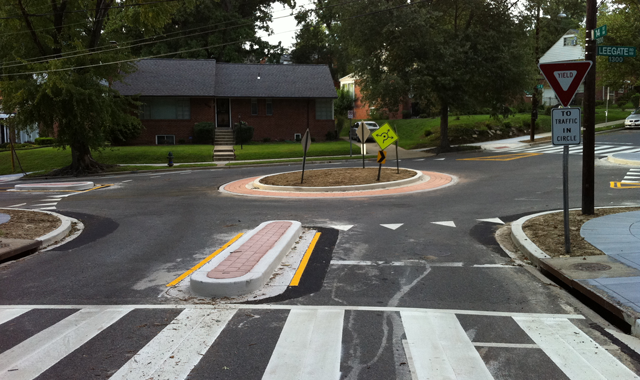 Neighborhood traffic circles can include a paved apron or mountable curb to accommodate the turning radii of larger vehicles like fire trucks or school buses. Larger circles should include splitter islands at the approaches. Vehicles over 22 feet may be allowed to turn left in front of traffic circles in some states; others expressly prohibit this movement. Traffic circles at T-intersections should include curb extensions before and after the intersection or use curb indentation at the top of the T to provide the same deflection benefits as at 4-way intersections. The circle should be landscaped to attract attention and for aesthetic reasons; trees should have clear stem heights of at least 8 feet and be no more than 4 inches in diameter, while other plantings should be no more than 2 feet high. Stop signs may be used in conjunction with traffic circles, but are not mandatory. Some jurisdictions use yield signs, while others discourage use of both stop and yield. Curb extensions and edge islands should be tapered at 45 degrees to reinforce the edge lines and should use plantings to increase their visibility. Edge lines should be marked to designate the travel lane. A landscaped center island may be used to separate opposing traffic and discourage drivers from crossing the centerline. On narrow streets with low parking turnover, parking bays may be used to create the lateral shift. Pinchpoints should provide a clear two-way travel path of less than 18 feet (12 feet recommended). Curb extensions and edge islands should be tapered at 45 degrees to reinforce the edge lines and use plantings to increase their visibility. The curb radius of neckdowns on local streets should be approximately 20 feet. Stop lines on side streets may be set back from intersections such that turning trucks can briefly cross into the opposing lane. Center island narrowings should be large enough to command attention – at least 6 feet wide and 20 feet long. In addition to the above retrofit treatments that narrow a street, some jurisdictions are building skinny streets or queuing streets, which are between 20 and 28 feet wide (with parking). On-street parking should be prohibited within 20 to 50 feet of the right-hand side of intersections to accommodate turning movements and increase visibility. Seattle’s standard, low-volume, non-arterial streets are 25 feet wide when parking is allowed on both sides. Click on the images below to view 3D concepts of speed management treatments. Decreases the likelihood that crashes will occur, by increasing drivers’ response time and minimizing motor vehicles overtaking movements. AAA Foundation for Traffic Safety. (2011). Impact Speed and a Pedestrian’s Risk of Severe Injury or Death. 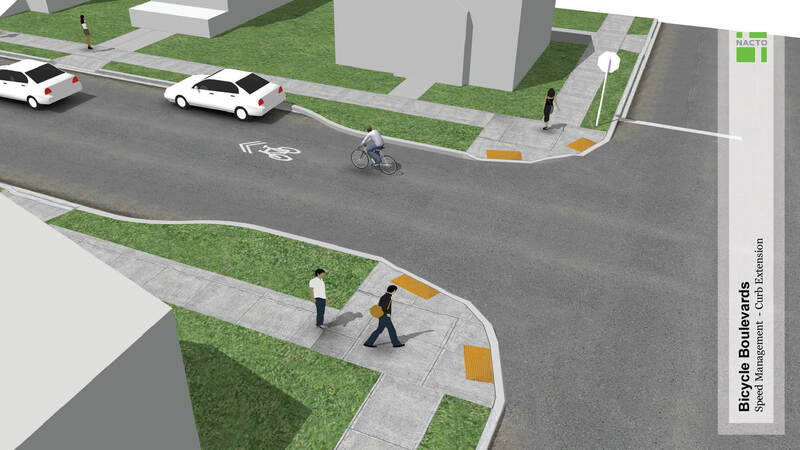 Improves bicyclist comfort and benefits pedestrians and residents by reducing traffic speeds along the corridor. Establishes and reinforces bicycle priority on bicycle boulevards by discouraging through vehicle travel. Provides opportunities for landscaping and other community features such as benches, message boards, and colored pavement in the intersection, benefiting all roadway users and residents. In general, a speed differential between motor vehicles and cyclists of no more than approximately 15 mph is desirable. Alta Planning + Design and Portland State University Initiative for Bicycle and Pedestrian Innovation. (2009). 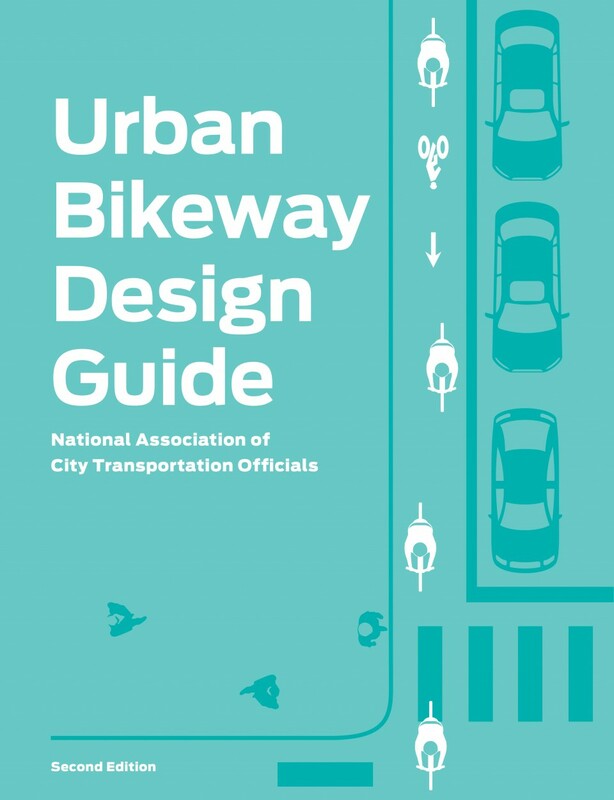 Bicycle Boulevard Planning & Design Guidebook. Streets where the neighborhood feels traffic speeds are too high and are supportive of speed management treatments. 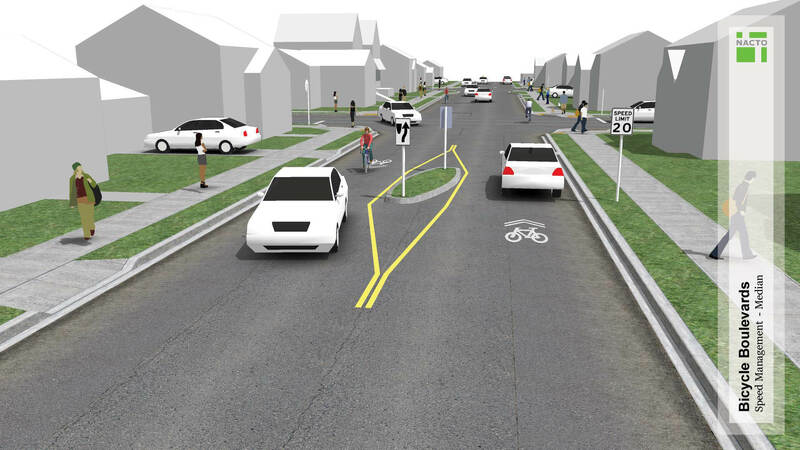 Streets where minor street crossing improvements to reduce bicycle delay (e.g., flipping stop signs to favor the bicycle boulevard) may otherwise encourage higher motor vehicle volumes and/or speeds. At high-use pedestrian crossings of a bicycle boulevard (raised crosswalk or intersection). Anywhere green infrastructure or sewer improvements are desired; bioswales can be integrated into the design of curb extensions, chicanes, pinchpoints, and narrowings. Click the image above to see the guidance summary page full screen. 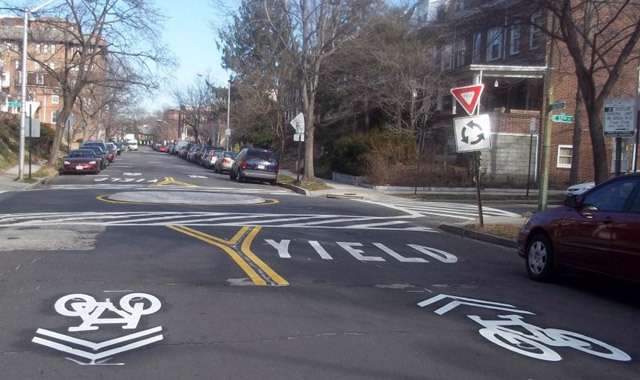 See MUTCD Chapter 3I for guidance on marking and signing islands and other features. 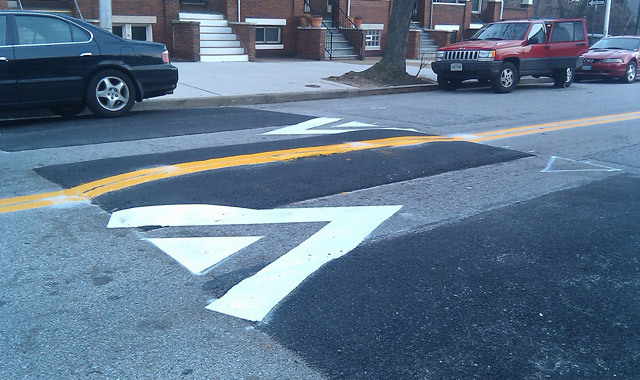 The Delaware Department of Transportation has also developed standard signs and pavement markings for traffic calming features following MUTCD guidelines. See ITE’s U.S. Traffic Calming Manual (Ewing and Brown, 2009) for guidance on use of speed and volume management techniques. When using horizontal speed management treatments, a minimum clear width of 12 feet for travel shall be maintained. Speed limits shall comply with local restrictions. Speed zones (other than statutory speed limits) shall only be established on the basis of an engineering study that has been performed in accordance with traffic engineering practices (MUTCD 2B.13). Speed limits shall be in multiples of 5 mph and signs shall be located at the points of change from one speed limit to another (MUTCD 2B.13). Seek approval by emergency response officials for treatments on emergency response routes. Emergency-vehicle-friendly treatments can include 22-foot speed humps, split humps (laterally offset speed tables), speed lumps/cushions (which have a gap that accommodates emergency vehicles’ wheels), or speed humps with a configuration of three lumps with a six-foot-wide center lump with one or two foot wheel gaps. Estimate travel time impacts on emergency vehicle response time, and define goals to evaluate during a trial. For a maneuverability test, cones are placed in the street to model the proposed dimensions of the treatments or street reconfiguration. Typical emergency response vehicles are then driven through the area, using every possible turning movement. Travel time tests should be discouraged. Research has shown a large variance between speeds with simulated devices (represented by cones) and actual devices as constructed. Ewing, R and Brown, S. (2009). U.S. Traffic Calming Manual. Implement speed management treatments on a trial basis, and work with emergency response officials to determine whether permanent features are appropriate. Speed management treatments should be used to reduce the street’s target speed to 20 mph. After speed management measures are implemented, posted speed limits should be reduced to match 85th percentile speed (5 mph speed increments are recommended). The impacts to traffic on adjacent streets should be monitored; while speed management treatments primarily affect motor vehicle speeds, they also reduce volumes, as drivers tend to avoid slower streets. Vertical deflection features should be placed regularly along a corridor to reduce speeds. Speeds increase about 0.5 to 1.0 mph for every 100 feet of separation for hump spacing up to 1,000 feet. Ewing, R. (1999.) 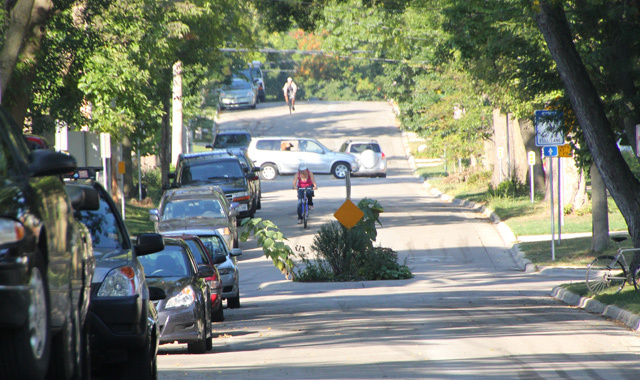 Traffic Calming: State of the Practice. Institute of Transportation Engineers. Side slopes on tapers should be no greater than 1:6 to reduce the risk of bicyclists losing their balance. The vertical lip should be no more than a quarter-inch high (Ewing, 2009). Horizontal speed control measures should not infringe on bicycle space. Where possible, provide a bicycle route outside of the element to avoid bicyclists having to merge into traffic at a narrow pinchpoint. This technique can also improve drainage flow and reduce construction and maintenance costs. Speed management may be implemented on a trial basis to gauge residents’ support prior to finalizing the design. Temporary speed humps, tables, and lumps are available. 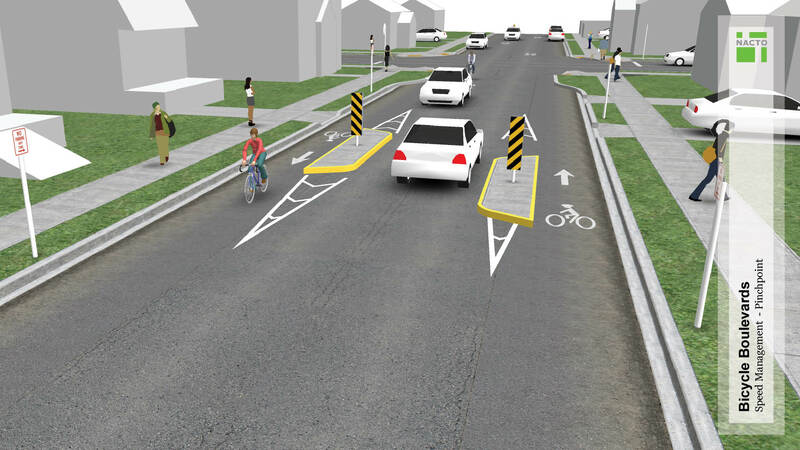 Temporary traffic calming should be used with caution as they can diminish residents’ opinions due to unappealing design and reduced functionality. Vegetation should be regularly trimmed to maintain visibility and attractiveness. Many cities in the U.S. have neighborhood traffic calming programs or public works departments that have installed speed humps or traffic circles. Cities that have designated bicycle boulevards have implemented a variety of speed management treatments. 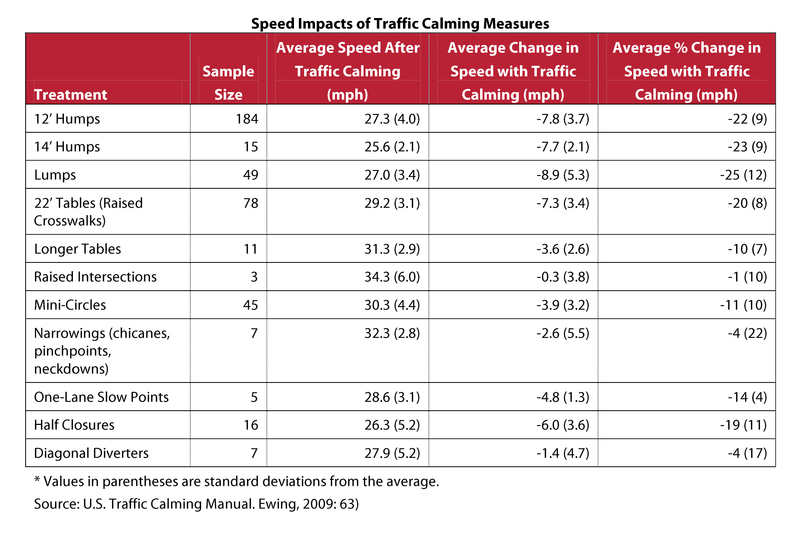 Just greater than half of the jurisdictions with traffic calming programs surveyed for the U.S. Traffic Calming Manual (Ewing, 2009) use trial installations to test speed and volume management techniques. References for Speed Management: 25 found. Wilbur Smith Associates, 2M Associates, & HPV Transportation Consulting. 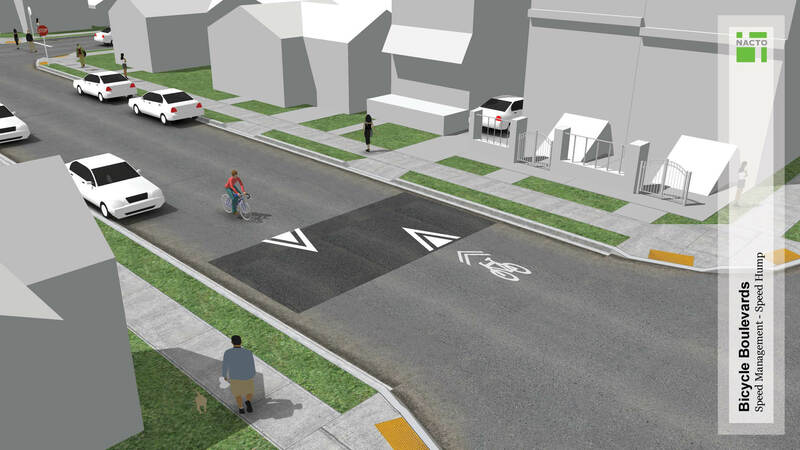 "Berkeley Bicycle Boulevard Design Tools and Guidelines." Planning and Development Department, Advance Planning Division, City of Berkeley, Berkeley, CA. Fehr & Peers. "Bicycle Facilities Design Manual Guidelines for the City of Redmond." Transportation Planning Department, City of Redmond, Redmond, WA. Hunter, William W., Thomas, Libby, & Stutts, Jane C.. "Bikesafe Bicycle Countermeasure Selection System." BIKESAFE, Federal Highway Administration, Office of Safety, Washington, DC. Walker, Lindsey, Tresidder, Mike, & Birk, Mia. 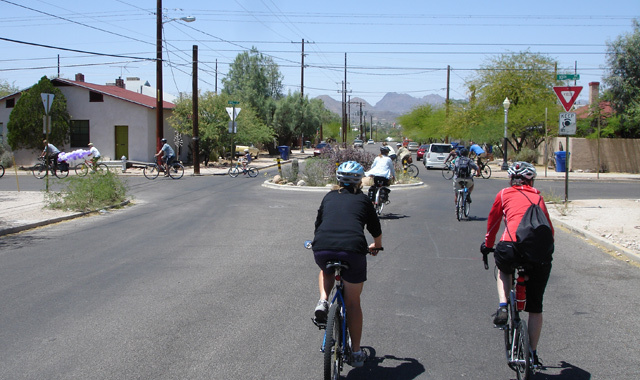 "Fundamentals of Bicycle Boulevard Planning & Design." Initiative for Bicycle and Pedestrian Innovation, Center for Transportation Studies & Center for Urban Studies, Portland State University, Portland, OR. Tefft, Brian. "Impact Speed and a Pedestrian’s Risk of Severe Injury or Death." AAA Foundation for Traffic Safety, AAA Foundation for Traffic Safety, Washington, DC. Portland Bureau of Transportation. "Impact Threshold Curve." City of Portland, City of Portland, Portland, OR. Pline, James L (ed). "Traffic Engineering Handbook, Ch. 15: Traffic Calming." Institute of Transportation Engineers, Washington, DC. Mundell, James E. "Neighborhood Traffic Calming: Seattle's Traffic Circle Program." Seattle Department of Transportation, Road Management & Engineering Journal, Houston, TX. Gulden, Jeff, & Ewing, Reid. "New Traffic Calming Device of Choice." Institute of Transportation Engineers, Institute of Transportation Engineers, Washington, DC. Neighborhood Streets Project Stakeholders. 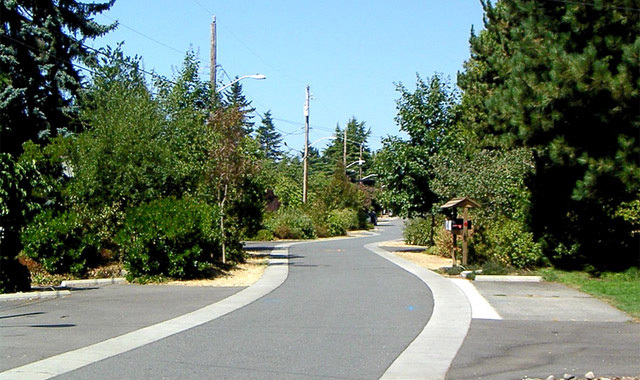 "Oregon Neighborhood Street Design Guidelines." Stakeholder Design Team, Oregon Department of Transportation, Salem, OR. Portland Bureau of Transportation. "Portland Neighborhood Greenways-Goals." Bureau of Transportation, City of Portland, Portland, OR. Portland Bureau of Transportation. "Traffic Calming Devices and Photos: Skinny Streets." Bureau of Transportation, City of Portland, Portland, OR. Ben-Joseph, Eran. "Residential Street Standards & Neighborhood Traffic Control: A Survey of Cities' Practices and Public Officials' Attitudes ." Institute of Urban and Regional Planning, University of California at Berkeley , Berkeley, CA. Streetswiki. "Skinny Streets." Accessed 2/2/2012. Mulder, Kathy. "Split Speed Bump." City of Portland, City of Portland, Portland, OR. Ewing, Reid. "Traffic Calming State of the Practice." Institute of Transportation Engineers, Federal Highway Administration, Office of Safety Research and Development and Office of Human Environment, Washington, DC. DeRobertis, Michelle, & Wachtel, Alan. 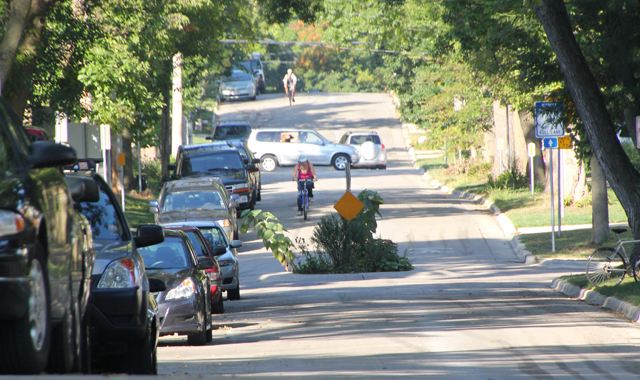 "Traffic Calming: Do’s and Don’ts to Encourage Bicycling." Transportation Research Board, Transportation Research Board, Washington, DC. Fehr & Peers. "TrafficCalming.org." Fehr & Peers, Walnut Creek, CA. Ewing, Reid, & Steven Brown. "US Traffic Calming Manual." American Planning Association, APA Planners Press, Washington, DC.